Register Log In Home Forums Virgin Oil Analysis - PCMO/HDEO Traveller 15w-40 Ford approved but the test says..
124 registered members (addyguy, 2003f7, Amenhotep, 53' Stude, 1978elcamino, ad244, 7 invisible), 2,202 guests, and 23 spiders. I got my VOA back from blackstone. Traveller is on the Ford approved list however this test shows the phosphorus is below 1,000 ppm. Does this additive package look weak? Attached is the VOA tell me what you think. Last edited by TravisR1020; 04/16/18 06:50 PM. I would use it if it's SN on the starburst like most traveller oil. Sorry Trav. What is diesel oil's ratings system? I've never used it but you never know. I bought some Traveller 15w-40 because it was on sale and on the Ford approved list but my curiosity made me buy a quart to get a sample from for a VOA. I just got the results back and it shows the Phosphorous below 1,000 ppm. 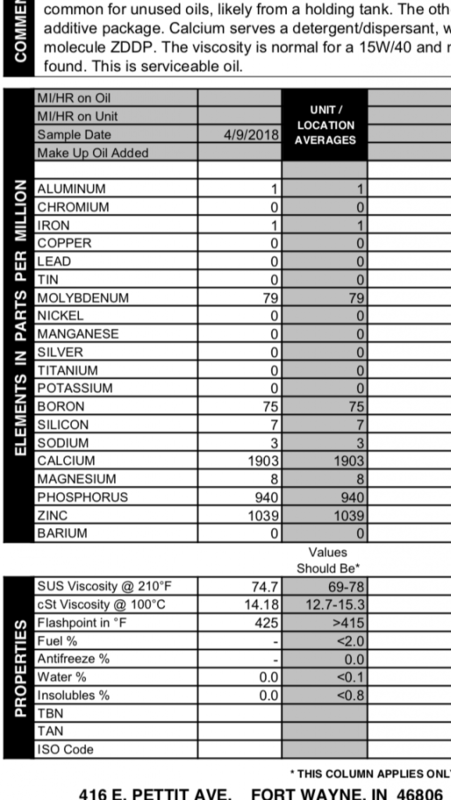 It was my understanding that to be on the Ford approved list the phosphorus had to be 1,000ppm at a minimum. How does this additive package look to you guys? Your opinions? Here is my VOA on Tractor Supply�s Traveller 15w-40. It�s on the Ford approved list but it�s below the 1,000ppm phosphorus levels I thought Ford required. How does this additive package look to you? I�m not sure about that. The current api is CK-4 if that�s what your asking. I would say yes, there is a margin of error for these labs, and 900+ is clearly not in the SN category of sub 800. Still holding a CJ4 badge, the 2013 sample of it at PQIA shows >1000 phos level. Lab variance or what landed in the bottle that day. 940 is close enough to 1000....certainly closer than the sub 800 SN requires. When I do VOA testing it never matches the PDS exactly...just close. HDEO in Diesel Engines. No spark plugs here. How many threads do we need on this? I agree, and I saw that on the PQIA website but in 2013 Traveller was blended by Warren Distribution. For a year now it�s been produced by Martin Lubricants. So I can only go off of this sample. Last edited by TravisR1020; 04/16/18 08:13 PM. Not sure if website is not updated as it's with CJ4/SM specs. No the website is outdated. Martin Lubricants emailed me saying traveller has been CK-4 for a year now but they are using up old labels. My Tractor Supply is just starting to get updated labels on their oil in the store now. The new oil containers have the new Ford spec on it. Most all production spec's have a "range" (allowed variation), typically centered around some nominal value. (example: target of 1000ppm phos +/- 5% would be 950 to 1050 ppm). However, in this case, typical ppm limits are either the top or bottom of acceptable. (example: 1000ppm min phos). I would say this is just a slightly weak sample; likely due to production mixing variation. Technically it should fail the Ford spec, but I'd not loose sleep over this. The next batch they mixed might have been a bit high? Who knows. There is always variation in production volumes of all products. I do NOT believe a PSD is going to grenade because the lube is down 60ppm of phos from it's rated value. Last edited by dnewton3; 04/17/18 05:33 AM. Formerly in marine engineering. In an earlier life I owned my own petroleum tank truck, and hauled for the majors and independent's.